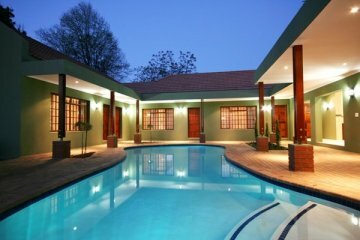 The 4 star Blackheath Manor Guest House and Conference Centre is situated on the border of Blackheath and Northcliff, close to the Cresta Shopping centre. 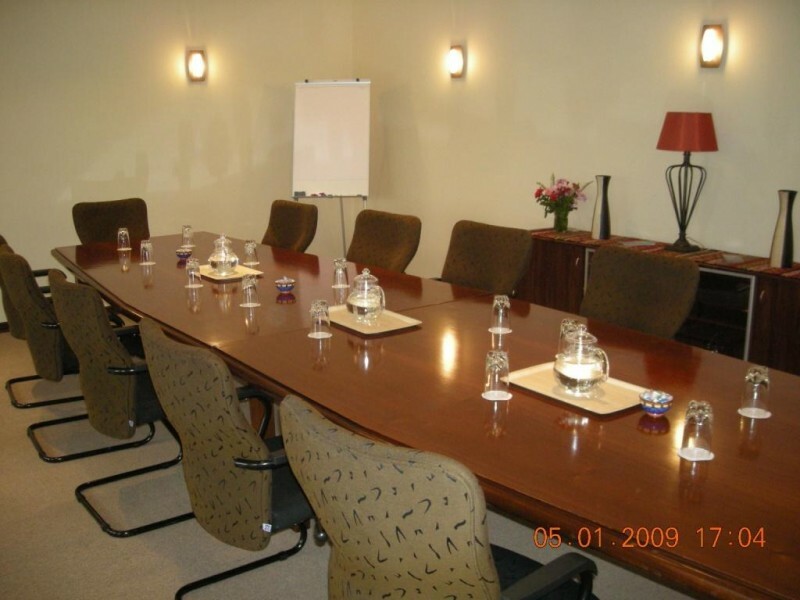 Business people visiting their offices in this area, or trainees attending one of the many training venues around Cresta, Fairylands and Rooseveldt Park, will find Blackheath Manor a convenient alternative to the more expensive hotels. We provide secure, luxurious accommodation in an established garden setting, creating a comfortable and relaxed environment to work in, or to relax in after a demanding business day. 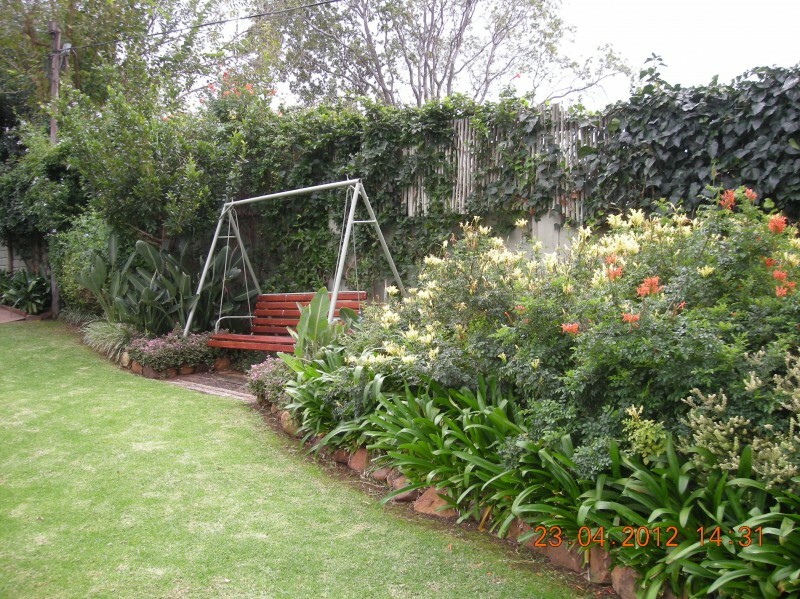 The 4 star Blackheath Manor Guest House provides secure, luxurious accommodation in an established garden setting, creating a comfortable and relaxed environment to work or to relax in after a demanding business day. 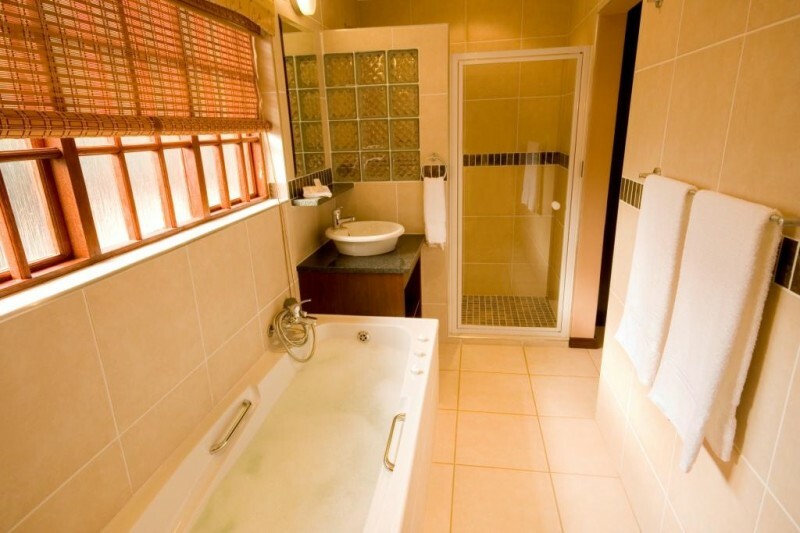 Each guest room is fully fitted with an air-conditioner, under floor heating, en-suite bathroom (including a bath, shower and double basins), a hairdryer, colour TV, DVD player and DSTV, tea & coffee facilities and a mini bar. A board room (seating 14 to 16 people) is also available and is ideal for those brainstorming or development sessions away from the distractions of the office. The conference room as well as our guest rooms have internet access. Secure, off-street parking is provided to all guests and visitors. 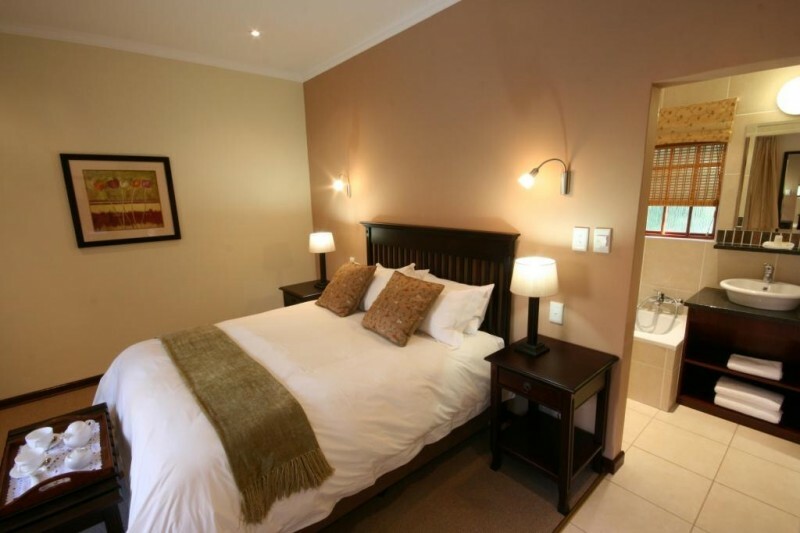 For the discerning tourist we offer suburban comfort and peace in a professional establishment that is close to a number of shopping centres, business parks and tourist attractions. To name but a few, local attractions or places of interest within a 100km radius include the SterkfonteinCaves, Maropeng, the WonderCaves, the Rhino & Lion Nature Reserve, as well as GoldReefCity, the ApartheidMuseum, Sun City. Trust us to take care of all your leisure bookings, travel arrangements and transfers. 6 luxury, en suite rooms, each with its own entrance opening onto the courtyard with a heated swimming pool. dressing table with large mirror & additional full length mirror. It is, however, the bathrooms that will truly impress the discerning traveller. Apart from the bath and the large, separate shower, double basins are set on either side of the bath along with ample shelving for guests’ toiletries, etc. With power outages a reality in South Africa the possibility of a cold shower is very real – but not at Blackheath Manor! Our hot water system is based on sophisticated gas- fired geysers which will continue to provide hot water even after prolonged power outages. An uninterrupted power supply (UPS) system has also been installed which will ensure that each room has at least one light and one plug point (dedicated to laptops) that will continue to operate when there is a power cut. Guest’s are invited to relax in the spacious lounge where they can read, watch TV, join other guests for a chat or entertain their visitors. 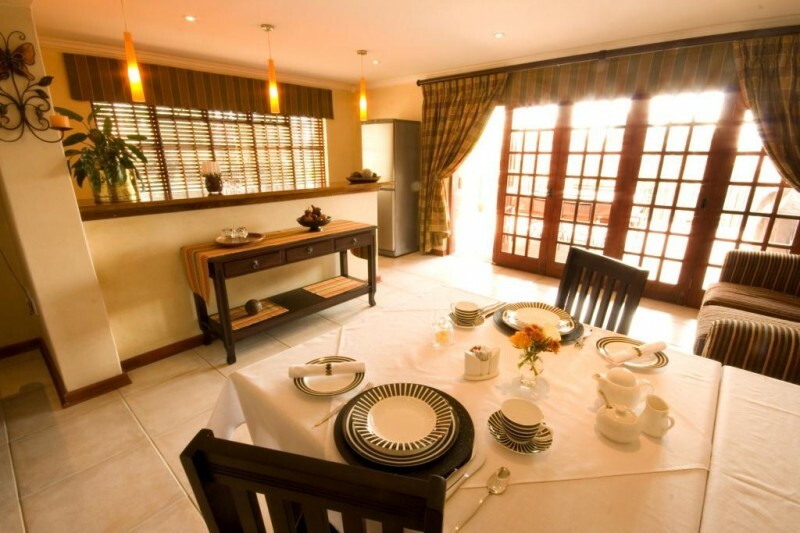 Adjacent to the lounge is the dining room, bar and patio where scrumptious traditional or fusion breakfast is served to guests and where our conference delegates can enjoy their meals. Our fully air-conditioned board room, which comfortably seats 14 to 16 people around a boardroom table, has a folding door which opens one complete wall leading onto the courtyard and swimming pool, ensuring a relaxed yet private atmosphere to work in. Full internet access as well as DSTV is available and any equipment you may require (data projectors, TV sets, screens, white boards etc. ), will be arranged. Tea/coffee and lunch is provided.